Samantha and Jason met with help from a dating app in the summer of 2015 (yes, they really do work!) and were engaged in February 2017 as Jason surprised her in Vegas when she thought she was going to meet a girlfriend for a long weekend! How cute!! Soon after, the couple bought a house in downtown Raleigh demolished the current home and built a beautiful brand new one, so of course they had to have their wedding there! The two started planning for their wedding right away, as Samantha headed to Louisiana to meet up with her family and find her dress! They couldn’t wait to start their lives together! I Dos- The two were married on November 11, 2017, under a tent in their backyard, surrounded by friends and family. The ceremony and reception both took place in the tent, in front of a beautiful blush drape backdrop adorned with hanging greenery. Guests were warmly welcomed with a glass of Rose or the cocktail of their choice. A simple ceremony included their siblings by their side as they said their I do’s. 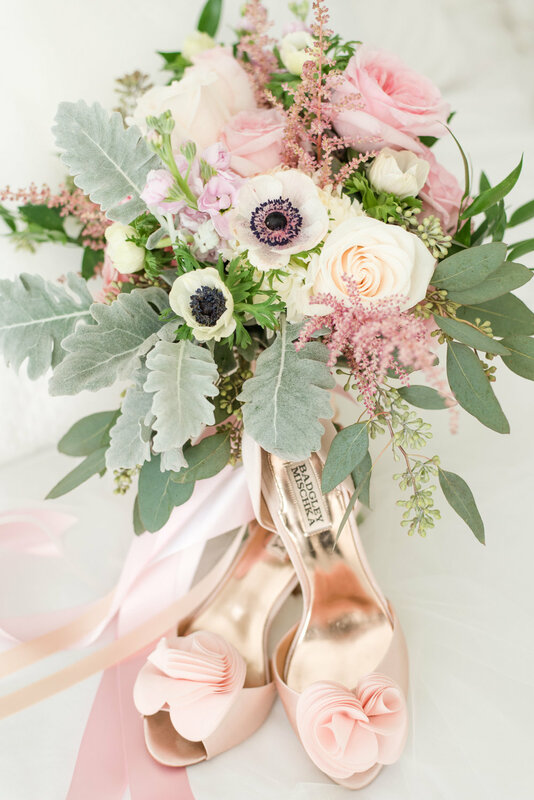 Samantha’s sister and bridesmaid wore a blush dress with cute floral accent shoes that matched the bride while Jason and his brother wore navy suits, blush tie. Post I Dos- The ceremony to reception was a quick turn around, as guests were soon seated at tables with navy linens, gold and blush accents! The buffet was a mix of food provided by Capital City Chefs, and the couple’s families. Samantha’s dad made incredible Louisiana jambalaya, and Jason’s family provided some delectable Italian dishes! The sweet treats were an Italian favorite, cannoli’s from Capital City Chefs, and carrot cake cupcakes made by the bride’s friend. But enough about the food, we have to talk about the first dance! Samantha and Jason surprised their guests with a choreographed first dance, which everyone loved! To say that these two are the perfect pair is an understatement! This awesome performance of course kicked off the dancing by getting everyone out on the dance floor. Thanks to Mario from K2 Productions for keeping the guests on the dance floor all night! Samantha and Jason were surrounded by family and friends...and sparkler’s, as they made their exit as Mr. and Mrs. Kogok! We are so happy for this beautiful couple and their start of a new adventure as husband and wife. We see so many smiling faces on days like this, and it never gets old! We wish these two nothing but love and happiness for many years to come!